RV CO and Propane alarms is 5 years. that are over 5 years old! Visit this site often for valuable information about RV alarm safety. View our Products page for links to full listings of our Carbon Monoxide Alarms, Propane/LP Gas Alarms, Dual CO / Propane Gas Alarms, Dual CO / Propane Gas Alarms with Valve Control, and Smoke & Fire Alarms. Listings include links to owners manuals, PDF sell sheets and photos. On the Training page you'll find Education Tests designed to improve RV technicians' knowledge of the history and performance of safety alarms installed in RV’s. 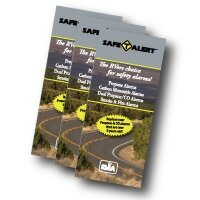 You will additional alarm safety information as well as Safe-T-Alert brand marketing materials on the Resources page. Visit that page to learn how high to install Carbon Monoxide alarms and potential sources of LP Gas leaks in RV's. All CO Alarms and LP Gas detectors should be replaced after 5 years of service life. Check the date code / replace by date on all alarms during service. If the detector is over 5 years old recommend replacement or have the RVer sign the Replacement Notice.